Materials scientists at Northwestern University in Illinois developed an ink made of a graphene solution that can print patterns for electronic circuits and maintain their conductivity even after folding. The team led by engineering professor Mark Hersam published its findings online in a recent issue of the Journal of Physical Chemistry Letters (paid subscription required). 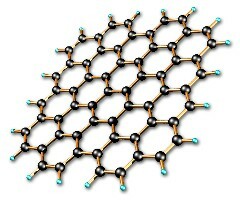 Graphene is closely related to graphite like that used in pencils, but consists of only a single atomic layer of carbon atoms. The material is very light, strong, chemically stable, and can conduct both heat and electricity, with applications in fields such as electronics, energy, and health care. Hersam and colleagues configured a form of graphene that can be dispensed with an ink-jet printer into predetermined patterns. Ink-jet printing is an established and inexpensive industrial process that can apply a range of liquified materials on a variety of substrates over a wide area, and adapted for electronics in making transistor circuits and solar cells. Adapting graphene to inkjet printing, however, is a difficult because of the inability to maintain enough graphene in liquified form to to keep conducting electricity. Extracting graphene from graphite normally requires a process that results in graphene oxide, which has less conductive capability than pure graphene. Graphene in pure form can be extracted from graphite, but the process requires solvents leaving residues that also reduce conductivity. Hersam’s team developed a technique with ethanol and ethyl cellulose for extracting graphene at room temperature from graphite that the researchers say can make it possible to mass produce graphene. The process results in a powder with little residue made of high-concentration nanoscale graphene flakes, which is then combined with a solvent for an inkjet ink. The researchers demonstrated the graphene solution by inkjet printing precise patterns they describe as suitable for flexible electronics. The patterns were printed in mutiple layers, each with a thickness of 14 nanometers; 1 nanometer equals 1 billionth of a meter. The ink, reports the team, is 250 times more conductive than previous attempts to print with graphene, which remained largely unchanged, even after subjected to stresses of bending.